Welcome to the Quechua Learning Community at Ohio State! Quechua study can be funded via the FLAS Fellowship! Quechua, the primary language family of the ancient Incas, is spoken by approximately ten million people in the Andes and highlands of South America, primarily in Ecuador, Peru, and Bolivia. Quechua language courses are of special interest to students who want to learn about the Quechua language, culture, and society; who are pursuing the interdisciplinary minor in Andean and Amazonian Studies; or who are working in areas such as Anthropology, Linguistics, Archeology, Spanish, History, International Studies, Political Science, Geography, and many other disciplines! 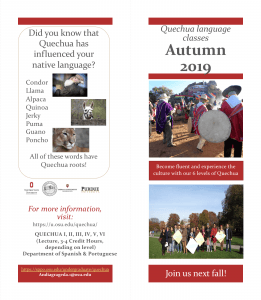 The purpose of this site is to provide a central platform containing information about the Quechua Language Program and Learning Community at The Ohio State University. Here you will find material with linguistic and cultural importance concerning the Quechua language and the Andes region of South America, links to resources that are tied to the study of Quechua and the areas where it is spoken, as well as testimonials of those who have studied the language and traveled to/worked in Quechua-speaking countries. Current and prospective students of our Language Program will also be able to find information for courses, study abroad, scholarships/fellowships, and other external, related resources. ***An interview with Anna Babel has now been posted under the ‘About’ section – go check it out to learn about her time spent in Bolivia and studying Quechua! ***Go watch Alexandra Castillo’s interview under the ‘About’ section to learn about her experience with Quechua and the Andes relating to her academic and professional pursuits! *** Interviews for Estelí Puente Beccar and Megan Hasting are now available under the ‘About’ menu – Go take a look and learn about their experiences with Quechua and the Andes! ***Go check out Devin Grammon’s interview about his experiences studying Quechua and being in the Andes under ‘About’!